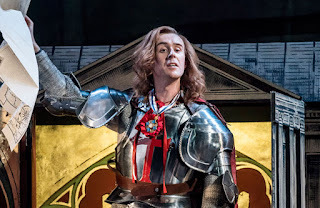 Last night Stuart and I went to see Rory Mullarkey’s new play Saint George and the Dragon at the Olivier Theatre at the National Theatre on London's glitzy South Bank. Upshot: Where this play should have perhaps been as sharp as Blackadder or as silly as Monty Python it ends up, less happily, being as tedious as a School Pantomime. The story is one of brave knight of yore George, slayer of dragons and saviour of the people, who becomes enfolded into our nation’s narrative, told over three very long hours. Confronting his enemy at three different stages of English history, George first saves a medieval village from a three-headed fire-breathing dragon (the most compelling part), then in a smoke-filled Victorian town outwits the dragon of mercantile capitalism (over-long), and finally in a modern, glass-turreted city takes on the dragon in more insidious, less easily defined form (rather unfocused). As they say, "Unhappy the land in need of heroes." While the play has much to say about our shifting national identity, the means seem disproportionate to the ends. There is inevitable and needless repetition in the idea of George’s attempt to rouse the populace against the tyrannical dragon and some scenes, especially those between an endangered heroine and a possible ally, cry out for swift and extensive literary surgery. Cut it in half and call it "Regrets"! The plot wanders with aimless direction, leaving us, the audience gasping for distraction. Underdeveloped stock characters and cheap looking stage effects (with the possible exception of the exploding dragon-heads on zip-wires) only exasperate our plight. 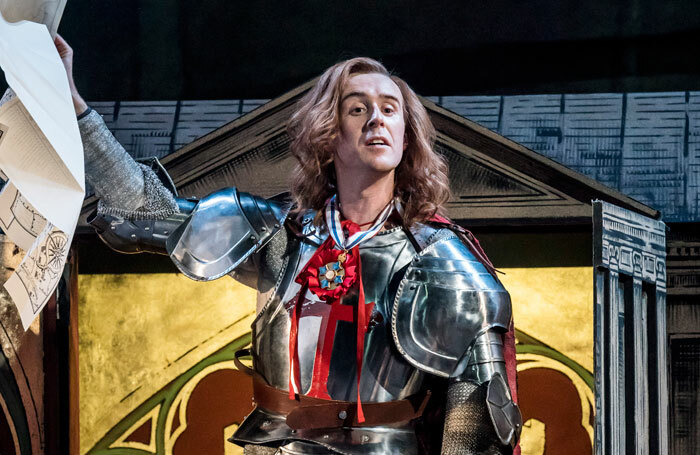 That said, John Heffernan excellently captures George’s transition from a perfect, gentle knight into a vainglorious, patriotic symbol and finally an absurdly outdated figure in a woolly hat trying to pass himself off as a man of the people. Julian Bleach, alternately menacing and camp, is an admirably shape-shifting dragon with a remarkable capacity to slither down the perpendicular walls of the set; and there is staunch support from Amaka Okafor as George’s increasingly assertive champion, Gawn Grainger as her accommodating dad and Richard Goulding as the dragon’s side-changing spokesman. The National Theatre faces a problem: where to find the big new plays it craves for the Olivier, its largest theatre? For the second time this year, it entrusts the space to a relatively new writer. While Rory Mullarkey’s epic folk tale about England’s national hero is more accessible than DC Moore’s Common and has a commendable ambition, like Common sadly it ultimate fails to deliver.